If a meeting is cancelled or rescheduled it is important to update TEAMeeting. The update ensures that no agenda item is lost and that the records are accurate. Future meetings are marked on a 3 month calendar. Click on the date of the meeting you wish to change. This will change the view to a meeting view. 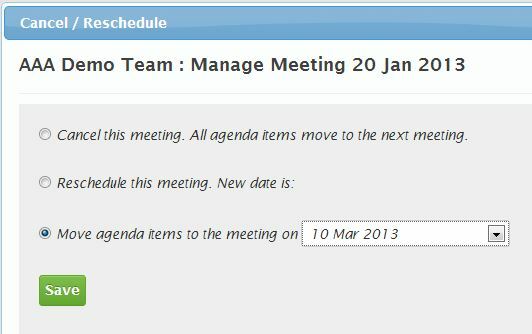 In the meeting view look for the Cancel / Reschedule icon above the agenda: Click on it. Cancel the meeting. All agenda items are assigned to the next scheduled meeting. Reschedule the meeting. You will be asked to select a new date. All Agenda items are assigned to the new meeting. Cancel the meeting and select a future meeting to review the items. You can select any scheduled meeting. Make a choice and Save.